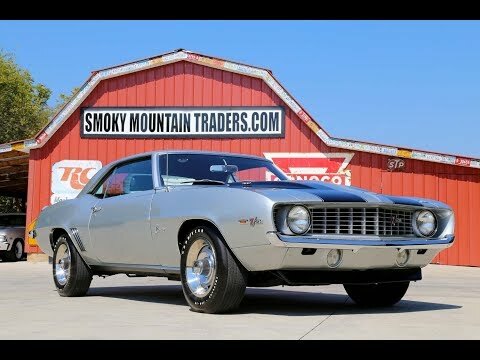 You're looking at 1969 Chevrolet Camaro Z/28. It comes with a binder full of original documentation, pictures, and other paperwork. This Camaro features the Numbers Matching 302 and has a lot of rare factory original installed options. When you walk around this '69 you will notice the body is laser straight down the sides and that the hood, trunk, and both doors all have a phenomenal fit with the gaps being near perfect. This Z is done in Cortez Silver, which is the factory color, that's accented by the Black Stripes. It's done in base coat clear coat, and has been buffed and polished to a deep rich shine that has a mirror finish. All the Chrome and Stainless is in excellent condition with the bumpers appearing to have been replaced. The glass also looks very nice with the windshield appearing replaced and the side glass all operating as it should. To finish off the look it's sitting on a set of 15” Rallyes with Goodyear Polyglass Tires. When you walk around this '69 you will notice the body is laser straight down the sides and that the hood, trunk, and both doors all have a phenomenal fit with the gaps being near perfect. This Z is done in Cortez Silver, which is the factory color, that's accented by the Black Stripes. It's done in base coat clear coat, and has been buffed and polished to a deep rich shine that has a mirror finish. All the Chrome and Stainless is in excellent condition with the bumpers appearing to have been replaced. The glass also looks very nice with the windshield appearing replaced and the side glass all operating as it should. To finish off the look it's sitting on a set of 15” Rallyes with Goodyear Polyglass Tires. Next, we will look at the interior of this Z/28. When you look on the inside you'll see it's done in Black with the Black and White Houndstooth seat covers. The Houndstooth is an upgrade over the original standard buckets interior, and when the covers were replaced it appears the padding was redone too. Looking at the headliner you will also notice it was replaced and that it has an amazing fit. This '69 does have the center console with the correct style Hurst Shifter. It also has the console gauges that are working. Looking at the dash, it has had the pad replaced and both the Tach and Speedometer work as well. You'll also notice it has the AM Radio that is still working. Under the dash it has a GM 8Track player, believe it or not we didn't have an 8Track around to check it, sorry. Inside the trunk it has the spare and bumper jack with the trunk pan being splatter painted. Under the hood it's powered by the Numbers Matching DZ 302 engine. It's set up with the correct 3932472 Winters Intake and the correct 3923289 '69 model Holley Carb. Staying under the hood you'll see it's dressed in the factory style aluminum valve covers and the stock style breather. The 302 is mated to the Muncie Four Speed trans and 12 Bolt Posi Rear End. Something super special about this car is the exhaust. It has factory GM Headers, which you don't see very often, they run through the chambered muffler and give it a killer sound. When you look under this Camaro you will be thoroughly impressed. The brakes lines appear replaced along with the fuel lines and gas tank. The front floor pans appear replaced, but they did such an excellent job it's hard to see where it was done. All the frame rails and subframe appear rock solid with the bushings being very nice.